The Pier at Rainbow Bridge ©2017 James D. Peterson. 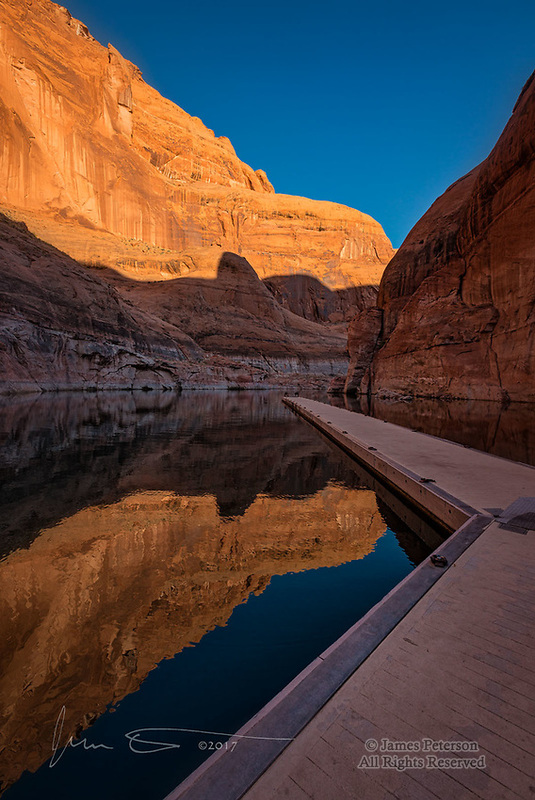 I recently had the great fortune to spend a couple days on Lake Powell with a good friend. It was a fine trip in ideal weather for boating, and the beauty of that territory is pretty much indescribable. Rainbow Bridge is only accessible by boat (well, I guess you can also get there by backpacking a long distance, but my backpacking days are ancient history), and most photographers who go there head straight for the bridge to capture some images. That, in fact, is what I did initially too. But it's also a good idea to look around and make sure you don't miss the beauty to be found in other directions. I waited for some nice sunrise light to hit the bridge itself, but it's situated between canyon walls that blocked the early morning sunbeams. Back at the pier, however, that glorious light was pouring into the canyon, making the walls glow and also creating a nice reflection in the water. And in addition to the sublime light, I loved the geometry of the resulting scene. So did my camera.